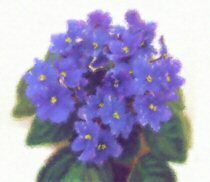 African Violets are remarkably easy houseplants to propogate. All you need to do is to take a healthy leaf from near the centre of a plant which is in good flower. Trim the leaf stalk down to about one inch using a sharp knife. Now dab a drop of your own perspiration (human sweat is an excellent rooting compound) on the cut stalk and push firmly into a pot containing a mix of 50% vermiculite and 50% soilless compost. Water and seal the whole lot in a plastic bag until you see lots of young growth. When the new African Violet plantlets are more than one inch tall, split them and plant out into their own pots. African violets grow best when they get some sunlight each day. An east facing windowsill is a perfect spot. African violets are sensitive to the chemicals that are found in tap water. Either use rainwater, or at least let the tapwater stand overnight in an open bucket to let the chlorine evaporate. Water with care so the leaves don't get wet as the plants don't like it at all.